All I said to the motorcycle taxi driver was “Cheap Beer” and although it appeared as though he didn’t understand he took off through the madness of Vietnamese traffic. My adventure buddy heard the Semester at Sea ship had just ported in Saigon and as he was formerly a passenger on it he parted ways to go see the ship while I explore whatever cheap beer meant to my driver. I was dropped off and walked into a run down building full of Vietnamese people chatting and drinking copious amounts of beer at picnic style tables over a floor covered in garbage and food. Being the only non-Vietnamese person in the place combined with my shiny golden hair made me stand out like a redhead in Jamaica, and briefly silenced the crowd of beer drinkers when I entered. As I awkwardly tried to figure out where and how to order a beer an excited Vietnamese man began waving his arms excitedly, signaling for me to come join him. 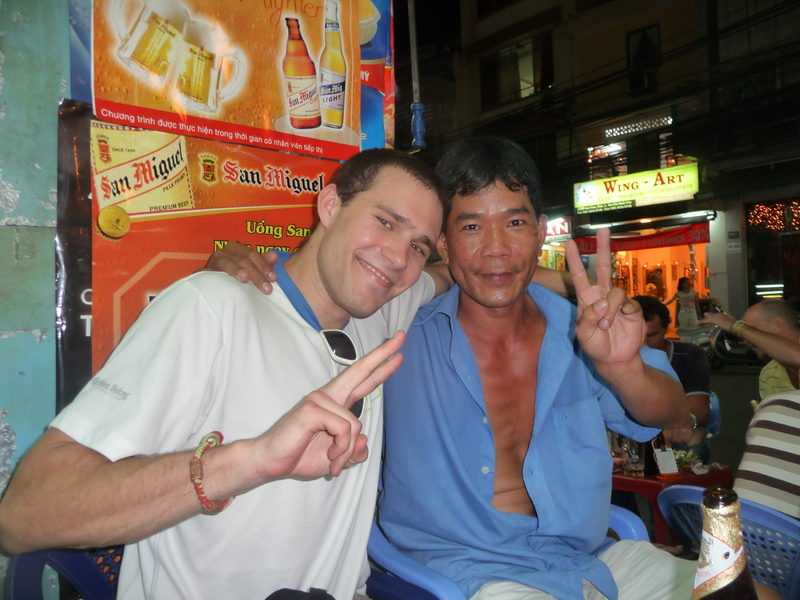 He was the only one at the table that spoke any English and we chatted for a while about Vietnam and traveling. He taught me a very important expression in Vietnamese “Mao, hi, ba, YO!! !” Which literally translates to “1, 2, 3, Cheers!! !” Eventually my adventure buddy came to join me and my newfound Vietnamese drinking buddies as we consumed jug after jug of some odd local brew. This dude was pure awesome and as our beer munchies began to kick in he insisted we come back to his house for dinner. Although he was even more intoxicated than we were, our adventure sense overruled our common sense and we both hopped on the back of his little motorbike and raced through some more harrowing Vietnamese traffic. With luck on our side we arrived at his house all in one piece. The guys name was Hue and he was one of 10 siblings. He excitedly introduced us to his mother, wife, brother and two kids who all lived in their tiny apartment. His brother’s name was also Hue, which was quite confusing and hilarious at the same time. 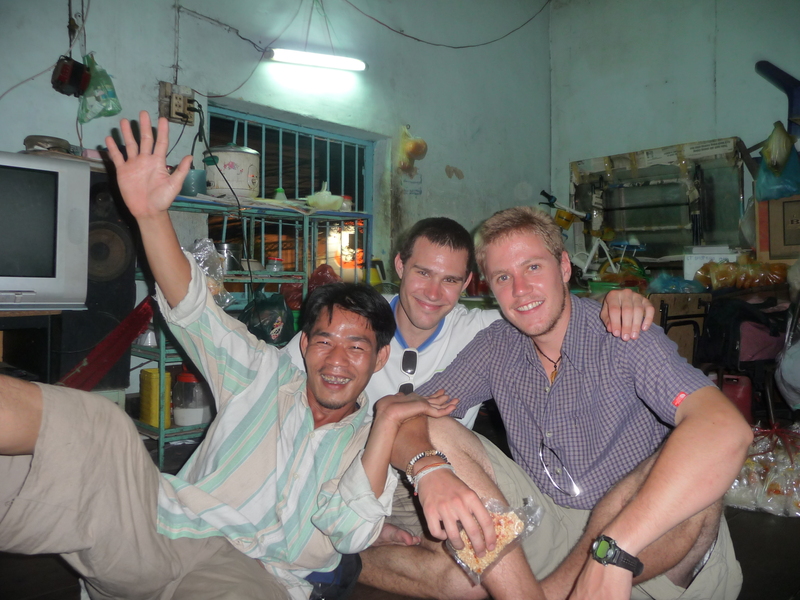 As his wife cooked us some Pho (Vietnamese soup), Hue showed us his dried rice snacks, which he sold for a living. The soup was absolutely the best I’d had in Vietnam, but the eating situation caused me some serious discomfort. I literally do not posses the ability to sit Indian-Style for more than one or two minutes without my entire legs going completely numb with extreme discomfort. Despite my smaller stature my legs are quite large and inflexible. In fact my father practically needs specially tailored pants, for the girth of his calf muscles are so large they can’t fit into normal ones. Clearly my legs were a gift from him, so you can imagine my dismay when there were virtually no chairs in Hue’s house and we were forced to eat on the floor. 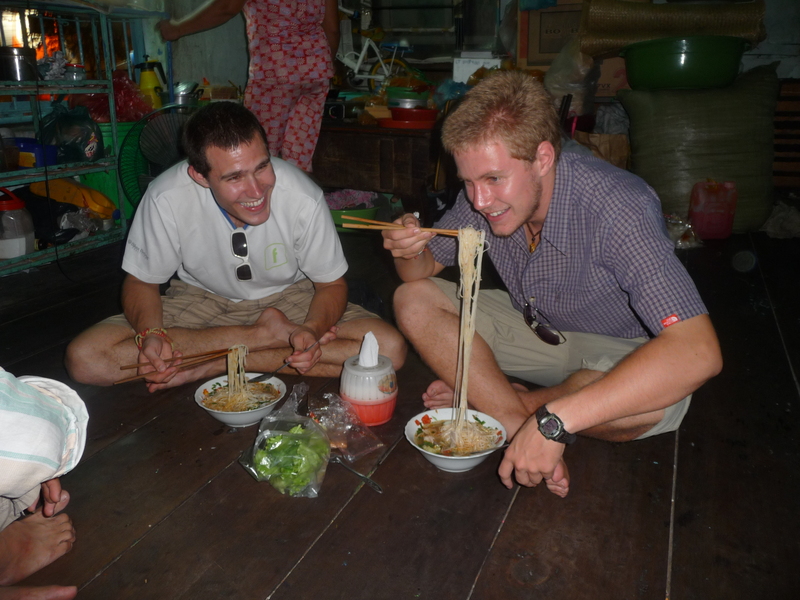 Eventually even the Vietnamese couldn’t watch me struggle with crossing my legs any longer and pulled out a small fold up table so I could eat while sitting. After the meal we decided to go out for beers with the brothers both named Hue. At one point Hue gave his 5-year-old daughter some money to go buy cigarettes for him, which was quite a shocker. Also, Hue’s brother kept offering Hue’s wife to me motioning that I could sleep with her if I wanted. Not sure if he was joking or serious, but I was quite bewildered by the whole situation. They took us to some interesting little roadside bars and I don’t think I’ve ever cheers’ed so many times in my entire life. Eventually the guys drove us back to our hotel and we thanked them for a truly awesome locals experience. 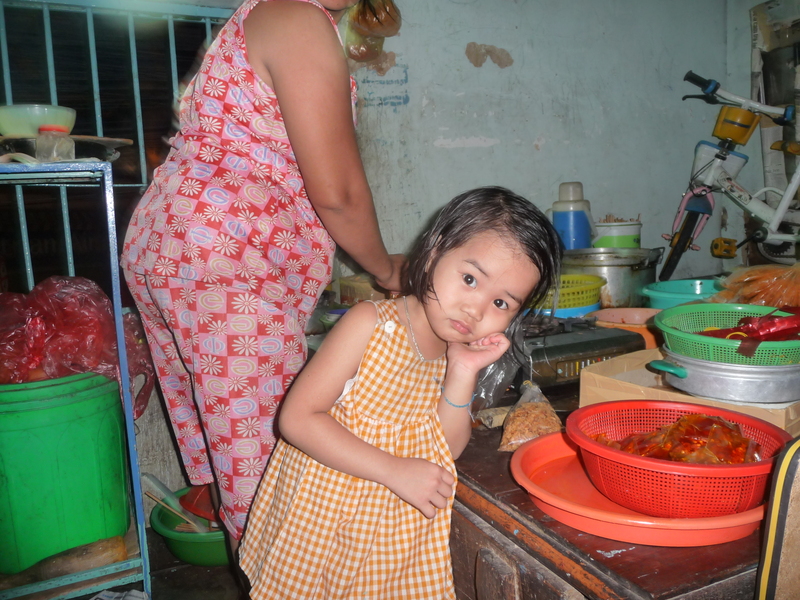 This entry was posted in Vietnam and tagged Adventure, Cheers, Pho, Saigon, Travel, Vietnam by verenico. Bookmark the permalink. So, you’re saying I’d stand out in Jamaica? I’m not really sure about that. I bet I could blend in with my red hair longer than you could sit Indian-Style! Challenge accepted. Montego Bay, Jamaica 2013! The contest will be timed, sunscreen will not be allowed. Alex Red will stand on a beach in all his red haired glory, Alexplorer will attempt to sit Indian-Style on that same beach. Will someone approach Alex Red with “A Mon You Don Look Like You Belong On Da Beach Mon” before Alexplorer’s legs give way to discomfort?? Ha a redhead in Jamaica! I know the feeling, but I think redheads stand out everywhere. Great local story. It is nice that you can be so adventurous when you travel and just throw yourself into what can be strange and different. Those certainly make for the best travel experiences.